Although HP devices were the first major smartphones to introduce wireless charging, it has recently quite rage-especially when Nokia decided to bring it to their latest Windows Phone 8 handsets. The XDA forum member vinas1 has been working on a wireless charging mod for the T-Mobile Galaxy Note 2, building on the work of member Ryan_G who has been working on the mod for the international Note 2. 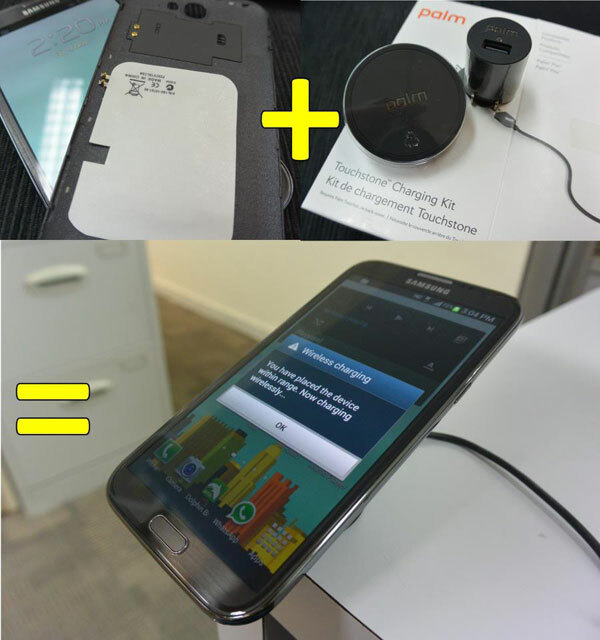 You may think, how it is possible, what they are actually doing to bring the wireless charger? Here is the answer for you. They use the Palm Touchstone wireless charging pad from the palm series of smartphones and also a bit of copper foil and electrical tape to enable the devices to have wireless charging. This wireless mod charger works well on the international Samsung Galaxy Note 2. But the T-Mobile Variant’s mod has a few problems, including one of the wires used in the mod hanging out of the USB port, but it works partially and should be working fully as vinas1 continues work on the mod.